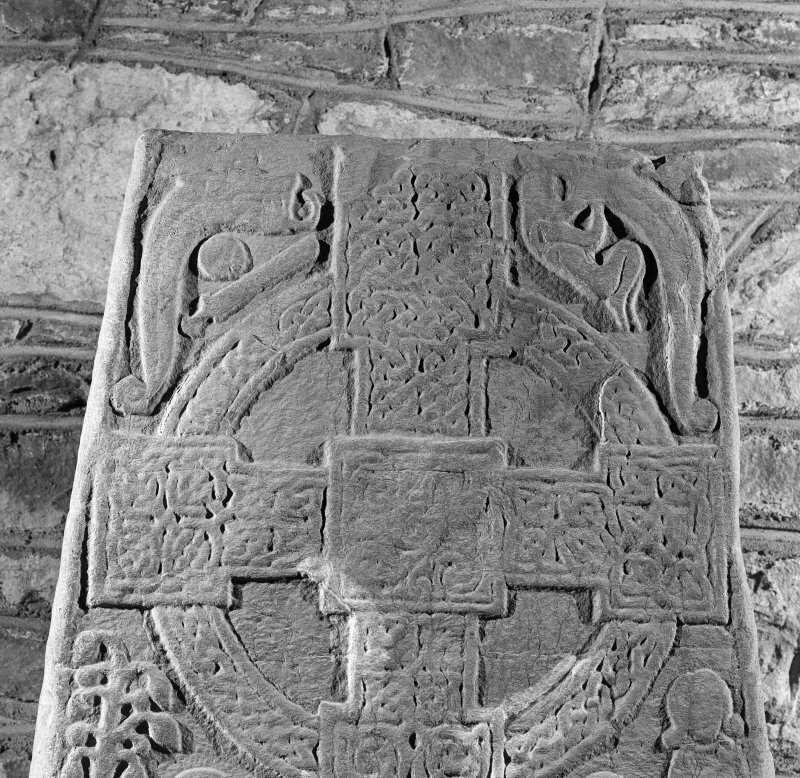 Front detail of cross slab, Fowlis Wester Parish Chuch. 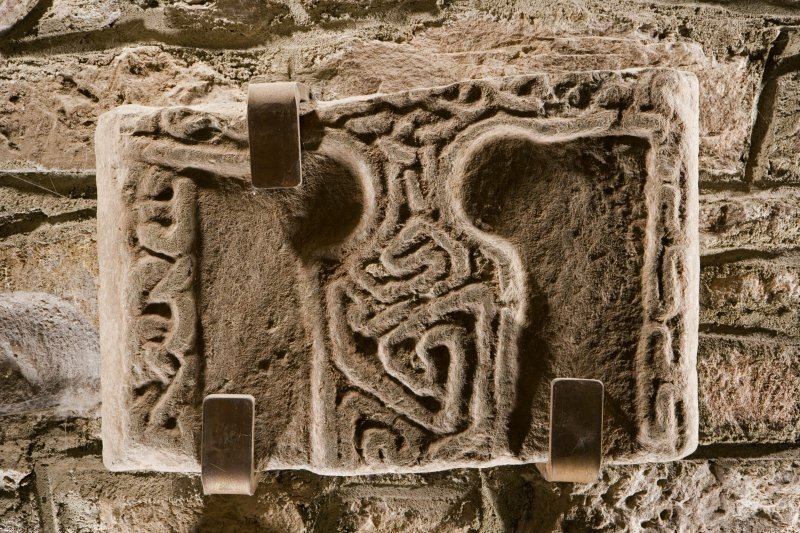 View of right lower panel from face of Fowlis Wester cross slab. 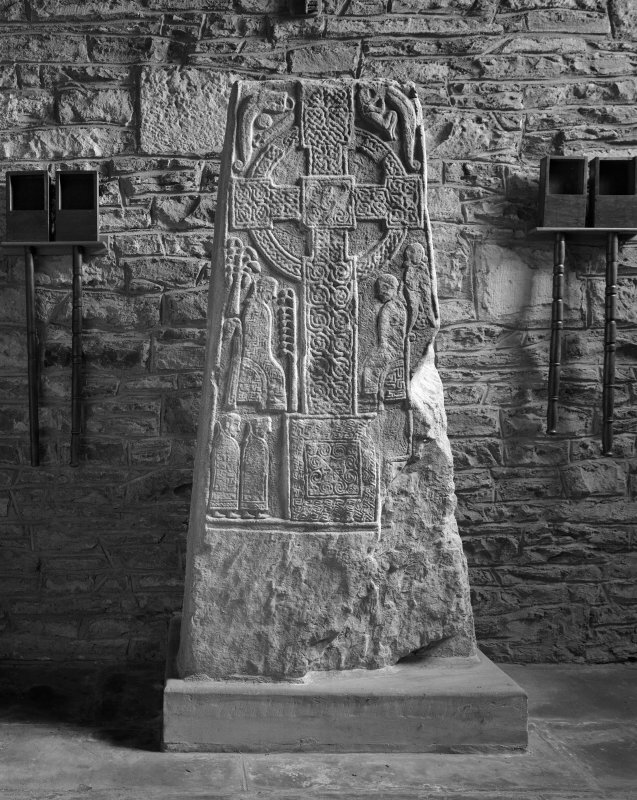 View of face of Fowlis Wester 2 cross slab. 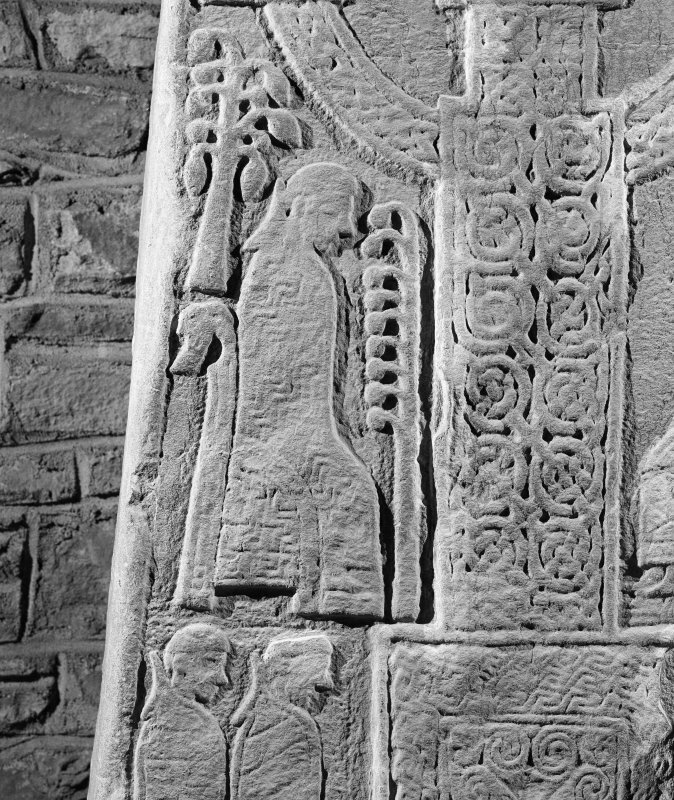 Front detail of Fowlis Wester cross slab. Present location: set in a concrete base against the north wall inside the church. Evidence for discovery: found in 1927 during the restoration of the church, reused in the exterior north wall. Present condition: some wear and the edges are damaged. A substantial tapering slab, this is carved on one broad face in finely detailed relief. Within a roll-moulded frame is carved a ringed cross on a rectangular base, each element of the cross outlined with a roll moulding. The arms are rectangular, each filled with different forms of knotwork, and the central square contains a cruciform design of double spirals and curls. The shaft is again filled with knotwork, and the base contains a central square with another cruciform design of double spirals, surrounded by diagonal key pattern. The ring of the cross-head is also filled with interlace. In the spaces on either side of the upper arm are S-dragons or fish-monsters, each with a spiral tail and each facing the cross. That on the left appears to have a protruding tongue curled round a small pellet, and its body curves round a circular shield and a sheathed sword. On the right, the jaws of the monster are clamped round the head of a naked human figure, perhaps depicting the story of Jonah and the whale. Flanking the shaft of the cross are two seated clerics facing the cross, each dressed in long and elaborately ornamented robes with folded hood, and their feet on a footstool. The chairs also bear decoration, key pattern filling the curved sides and the backs terminating on the left with a large zoomorphic head and on the right with a spiral. 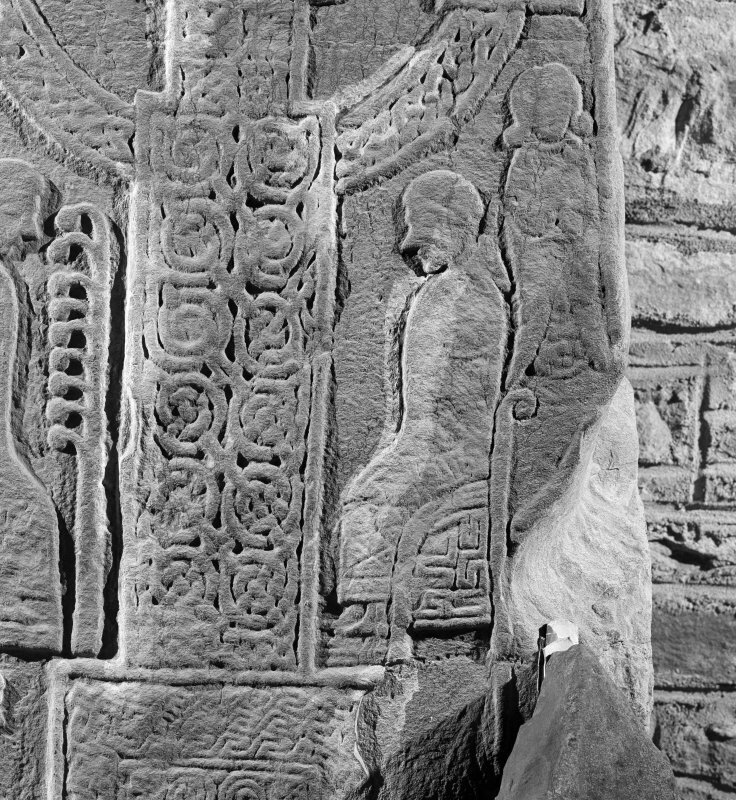 In front of the figure on the left is a stylised plant with nine branches bearing large round fruit, and a small tree with leaves and berries is carved behind the head and shoulders of the seated figure. In the same position behind the right-hand figure is a frontal figure with long curled hair and full-length robes. Facing the cross-base on the left are two clerics in long decorated robes, folded hoods and decorated borders. A large part of the bottom right corner of the stone had flaked away prior to the carving of the slab, and thus there is only a small plain panel beside the cross-base on the right. References: Waddell 1932; Henderson & Henderson 2004, 153. 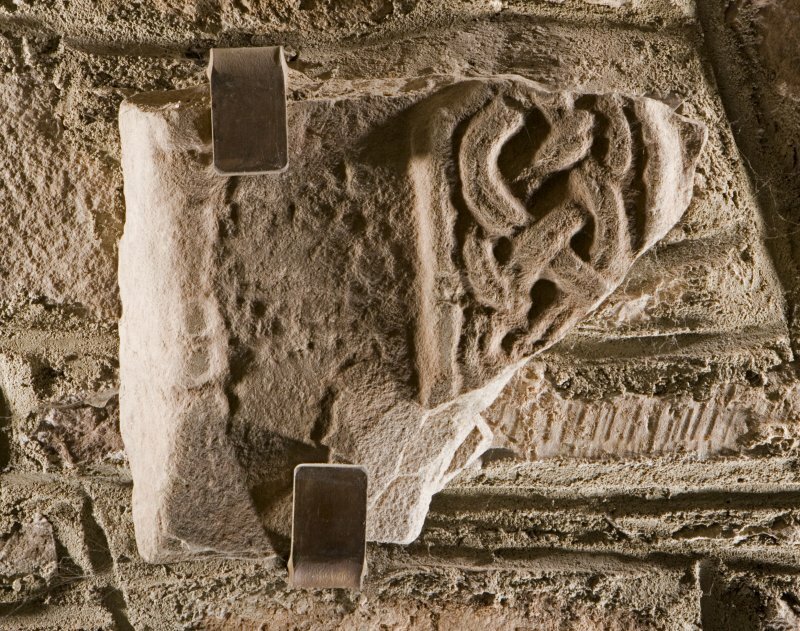 A cross-slab and two fragments were found during the restoration of the parish church of Fowlis Wester (NN92SW 7). 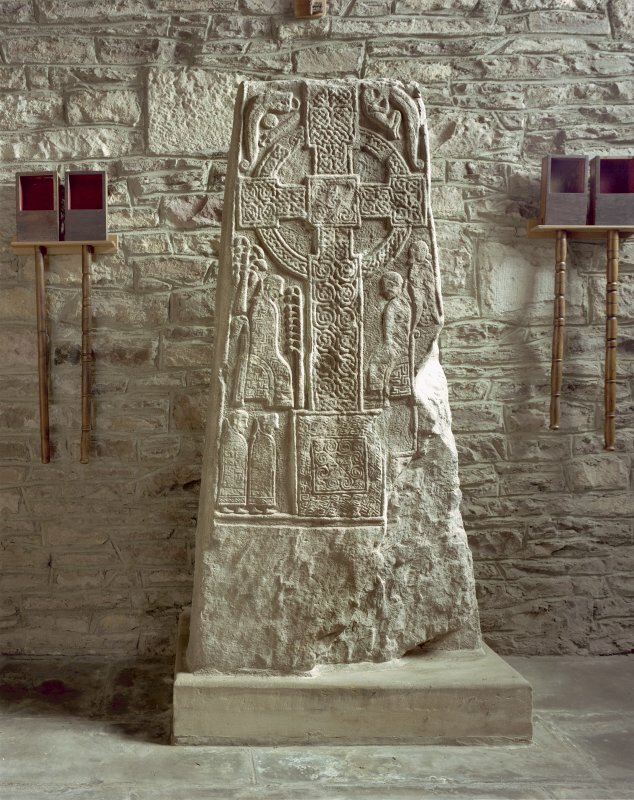 The slab design consists of a very finely enriched cross standing on an upright oblong base, in this respect resembling the standing cross out in the square at Fowlis Wester (NN92SW 5). It is decorated with spirals and key patterns. The remainder of the field is sculptured in low relief with animals and figures. As described and illustrated by Waddell, the cross-slab and fragments stand within the church against the north wall. Visited by OS (RD) 12 December 1966. 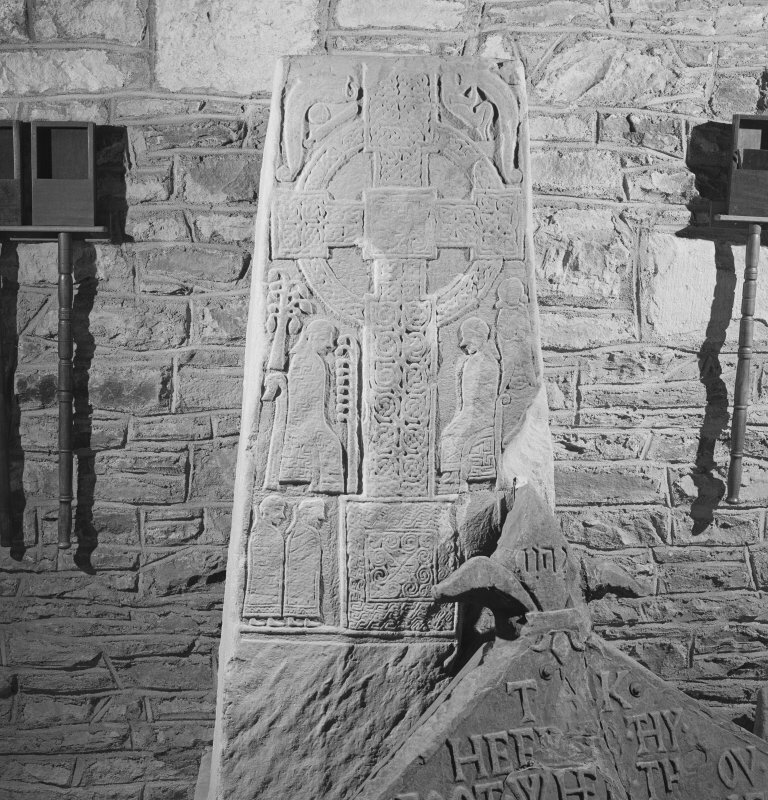 One complete cross-slab and fragments of two others were found in the course of the restoration of Fowlis Wester church (NN92SW 7) in 1927. The cross-slab is now set into a concrete base in the N aisle of the church and the two fragments are clamped to the wall of the building above it. 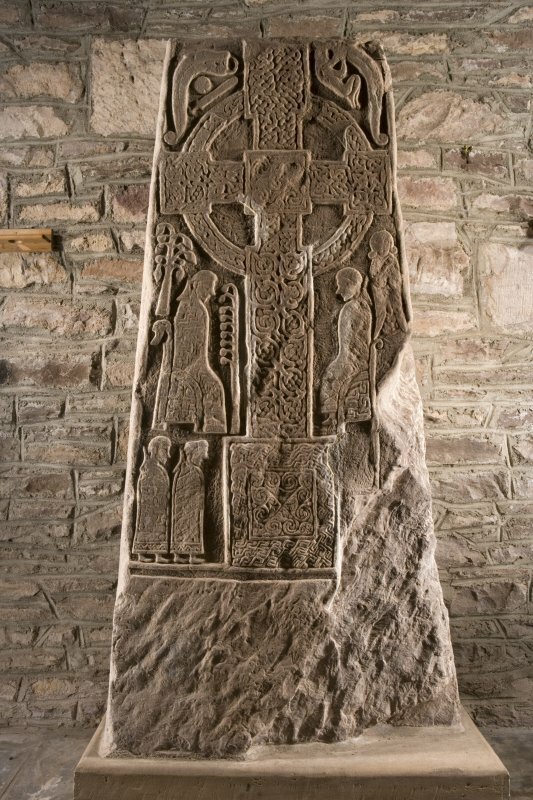 The cross-slab tapers markedly upwards from the base, and is carved in relief on one face. This is in a fine state of preservation, and displays a wheel headed cross with square central boss and rectangular terminals to the arms, all filled with interlace. The foot of the cross rises from a rectangular base with a central panel of spirals and a border of rectangular key pattern. To either side of the upper arm of the cross is a sea-monster with a spiral tail. That on the left is accompanied by a round shield and a broad-bladed sword with a heavy pommel and a straight guard. The monster to the right is in the act of biting the head of a naked, struggling man. To either side of the cross-shaft is a seated ecclesiastic. That to the left is surrounded by three stylised plants. Behind the ecclesiastic on the right is a second figure, unusual in being depicted facing the viewer, whereas all other figures are shown in profile. To the left of the cross-base stand two further ecclesiastics, clad, as are the two seated figures, in key-patterned cloaks with hoods thrown back. There is no corresponding panel to the right of the base, owing to an irregularity in the surface of the stone. The reverse of the slab is not sculptured, and has been left rough. Of the two small fragments, the first bears a portion of an interlace filled shaft, a blank panel, and a plain edge moulding. The second bears the upper portion of a cross, broken along the line of the two horizontal arms. These are filled with a pattern of interlace. The upper arm, which is decorated with a key-pattern, tapers upwards from a narrow waist formed by a pair of semi-circular hollows above the cross arms,. Visited by RCAHMS (IF, JRS), 27 October 1995.